So this is it... a week before we move out of our little urban highrise and into our suburban home. My pots and pans are packed, my pantry is cleared out and the kitchen will be closed for a week until I'm settled into the kitchen waiting for me in the suburbs. I'm anxious yet bittersweet about leaving my amazing kitchen views of downtown Chicago. However, I know waiting for me is a bigger kitchen to play in. To end my cooking and baking adventures in my small and cramped city kitchen, I'm celebrating on a sweet note. Surprisingly, these little cupcakes were made with very minimal ingredients in my pretty scarce pantry... and yeah, it's prettty scarce. I'm out of eggs, milk and bread too. In fact, my fridge looks even worse than a typical frat house fridge, minus the beer. All I've got in my fridge right now are half empty bottles and jars of random condiments, a couple sticks of butter, a little bit of heavy cream, 1/2 a package of shredded mozzarella cheese, handful of baby carrots and a pitcher of water. As for my freezer, I've got quite a bit of various nuts, frozen corn cobbettes, a bag of frozen spinach and a couple frozen pizzas. My cupboards aren't looking any better. I've got all the basics - flour, a few kinds of sugar (white, brown, powdered, etc. ), salt, spices, vinegar, baking extracts and a couple bags of baking chips and baking chocolate. Sad, right? But wait... lurking within these ingredients is a heavenly dessert. It took me awhile to discover it but it's there! These caramel pecan cupcakes were made with the very little ingredients I have and that just goes to show that I can have my cake and eat it too, even with barely nothing to work with! The secret to these cupcakes is definitely the mayonnaise - it kept the cake moist and was used in place of eggs. 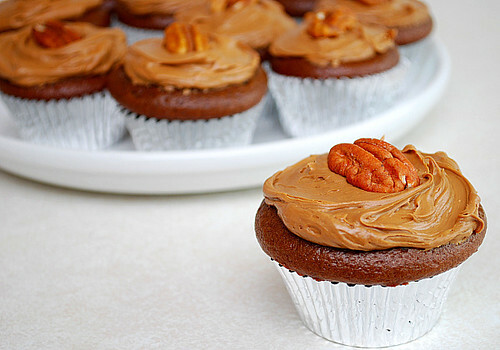 I made a simple caramel frosting and after frosting the cooled cupcakes, I topped them with toasted pecans to finish them off. So here's to the awesome times I've had cooking and baking here in downtown Chicago... and I'll be back in a week to my regularly cooking and baking adventures. However, I may pop in with a couple posts that I never got around to posting but stay tuned, lots of good stuff is in store! Preheat oven to 350 degrees F (175 degrees C). Line a muffin pan with cupcake liners. Pour the melted chocolate into the bowl of a stand mixer. Add the mayonnaise, vinegar and vanilla until blended. Combine the flour, sugar, baking soda, and salt in a large, separate bowl. Gradually stir into the chocolate mixture and mix to combine. Slowly stir in the warm water. Pour batter into prepared cupcake liners. Bake in the preheated oven for 25-30 minutes, or until a toothpick inserted into the center of the cake comes out clean. Allow to cool. Melt butter in small saucepan. Add brown sugar and 1/3 cup cream. Cook over medium-low heat until the sugar is dissolved, about 2 minutes. Remove from heat and add vanilla. Transfer to a large bowl. Using a handheld electric mixer, beat in confectioners' sugar a little at a time until smooth. If frosting is too thick, add 1 tablespoon heavy cream at a time until consistency is as desired. those look fantastic. Must make. Good luck with the move! Oh my! What yummy goodness! Mayo and vinegar are ingredients in the cupcake? How interesting. This looks absolutely divine...definitely need to try this soon. Good luck with the move...looking forward to some amazing baking posts from your new kitchen when you get settled in. I have a recipe for chocolate cake with mayo- its called Wacky Chocolate Cake. I bet these are amazing. best of luck with the move! i just moved myself... wow! what a process. your caramel frosting looks absolutely aaaaamazing!! I can't stop staring at the frosting. I've made a Paula Deen recipe for caramel frosting, but the brown sugar was still grainy in the finished product. Good taste, but would have preferred a smooth frosting. So I'm wondering if this version is smooth or if you can feel the sugar grains? It looks so caramelicious! Congrats on the move and good luck! Remarkable! There you are in the middle of moving and you're baking up such deliciousness. I can only imagine what you will be creating in that new kitchen of yours. 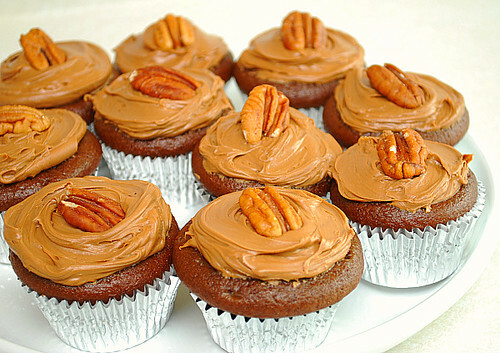 Good Luck with the move and thank you so much for sharing these delectable Caramel Pecan Cupcakes!!! The recipe called for 1 egg, what would you suggest? you can see the recipe at http://archintrain.blogspot.com/2010/03/what-do-we-love-chocolate-cake.html I would love your input! Hope the move goes well! I have to say some days I want nothing more than to get out of the city and have a real home (with a giant kitchen, of course!). Yes good luck they look yummy! I always bake cupcakes the first thing when I move in to a new place & usually a batch of cookies to say good bye to the old place before I go. Always made me feel better about leaving. Cupcakes are like a new beginning adventure. I have just made these...and I threw them all in the bin ! They were foul ! They had a hard crust and the insides of them were very "doughy"